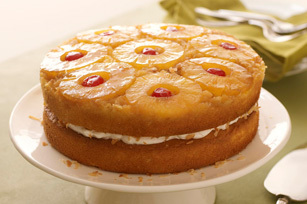 Turn a frown upside down with our Pineapple Upside Down Cake Recipe. You'll flip for the tropical taste of our Pineapple Upside Down Cake Recipe—it's perfect for a summertime treat, or to add some sun to the dessert table of any occasion! Drain pineapple, reserving 1/2 cup juice. Beat cake mix, eggs, sour cream, oil and reserved pineapple juice in large bowl with mixer until blended. Pour butter into 9-inch round pan; sprinkle with sugar. Arrange pineapple rings and cherries over sugar; sprinkle with 1/2 cup coconut. Cover with half the cake batter. Cover bottom of second 9-inch round pan with parchment; spray with cooking spray. Fill with remaining cake batter. Bake 45 min. or until toothpick inserted in centers comes out clean. Cool cakes in pans 5 min. ; invert onto wire racks. Remove pans and parchment; cool cakes completely. Place plain cake on plate; spread with COOL WHIP. Sprinkle with remaining coconut. Top with second cake layer, fruit side up. Enjoy a serving of this treat on special occasions. Heat oven to 350°F. Prepare batter as directed. Pour melted butter into 13x9-inch pan; sprinkle with sugar. Arrange pineapple and cherries over sugar; sprinkle with coconut. Cover with batter. Bake 35 to 40 min. or until toothpick inserted in center comes out clean. Cool cake 10 min. Invert onto serving tray or platter; remove pan. Cool cake completely.